Note: The IBM i system value, QTIMZON, allows you to change your system time for daylight saving time automatically. If your operating system is at V5R3 or higher, see, "Using Robot SCHEDULE with the QTIMZON System Value" under online Robot Technical Support. If you live in an area that observes Daylight Saving Time, your IBM i clock needs to be reset just like all the other clocks in your life (remember the mnemonic: Spring forward; Fall back). The CL program shown below should do the job for most of you. Have your programmers review it before using it at your site. Note: If you are on Robot Schedule 12.13 or higher, you no longer need to create and use the CL program defined below. You can select the Enable Daylight Saving Time automation field within the System Defaults window on the Robot Schedule GUI, see Using Robot SCHEDULE with the QTIMZON System Value for more information. 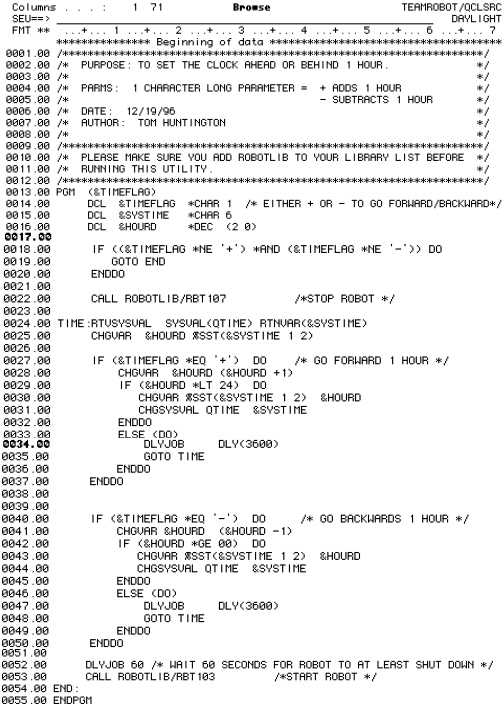 Once you have created the CL program, you can set up a Robot SCHEDULE command job to call it. Simply have Robot SCHEDULE change the system clock for you on the appropriate day at the appropriate time. We recommend that you run this program either before or after Saturday night’s processing. If the program recognizes an hour less than 0 or greater than 24, it will automatically delay 1 hour and try the change again. The CL program restarts Robot SCHEDULE to pick up the new time. You can modify the program to restart additional products so they pick up the time change. If you have the following products, add the corresponding commands to the program after the command to end and/or restart Robot SCHEDULE.